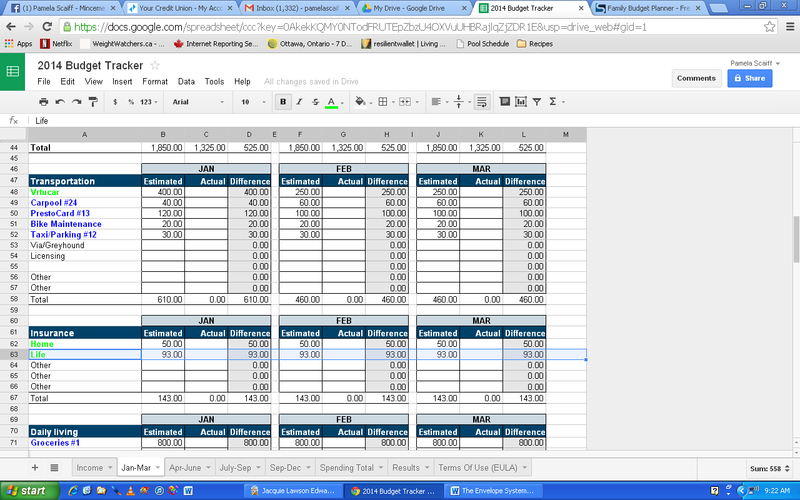 Free Budget Tracker that Peter and I like! They let you track what you estimate you will earn and spend AND what you actually earn and spend. They show you easily what you spend in each category. They can be saved in a few different formats. We like Google Docs because it means we can both see the budgets from our own computers when we share them with each other. We changed the colour of the categories, too. Blue is for physical envelopes, green is for payments online. Income: Figure out how much money you actually bring home after taxes. If you make $11 an hour and work 40 hours a week, you are not bringing home $440.00. After taxes, how much money do you have left to use? Check your paycheque to see what your take-home pay is. Fixed Costs: Go through your bank statements and bills and, using your budget template, fill in the expenses that are the same every month and that you likely pay online… like rent/mortgage/hydro/gas/phone/internet/payments. Savings: Make a category for saving. Plan to put a fixed amount into the account every paycheque. The idea is to start creating an emergency fund no matter how little money you have coming in. The money gurus suggest you pay yourself 10% of your pay each payday. If you can, great! If you have enormous debt, then start with just $10 a payday until your debt is gone. Income minus Expenses: Do the math: Do you have enough money coming in to cover your expenses? If you don’t, you are using credit to survive… every month. Start shaving until it balances.